Looking down on Rio. Image: Getty. Vila Autódromo is a small favela perched on the edge of the Olympic Park developments in Rio de Janeiro. The official plan for the park ensures that there’s space for the community to keep living there, and Rio’s mayor, Eduardo Paes, promised that nobody would be forced to leave. Yet since Rio was awarded the right to host the games, many homes in the community have been destroyed to make space for construction works. In some cases, evictions have turned violent. In others, dwellings are demolished without warning – for example, one resident’s house was destroyed while she was at a doctor’s appointment. These evictions – and the protests and social movements they have incited – have formed the focus of my doctoral research. The favela sits on a beautiful lagoon in Rio’s fast-developing West Zone. It would make for prime real estate, fuelling speculation that the current residents are being evicted to free up the land for redevelopment. Prime real estate. Image: Buda Mendes/Getty Sports. [It] gives policy makers a pretext to do whatever they want. If you think favelas are violent by nature, you’re going to think any policing is good policing. If you think favelas are precarious, horrible places to live, then you’re going to think any public housing is good housing. This stigma gives the impression that residents would be happy to be relocated to new housing built under the Brazilian government’s Minha Casa, Minha Vida (my house, my life) programme – a R$34 billion house-building initiative, which has been used to resettle those removed from favelas. Indeed, it is estimated that 80 per cent of Vila Autódromo’s 700 or so families have accepted compensation and moved to alternative accommodation. This is a result of a campaign of pressure by the city described by residents as “psychological warfare” and “terrorism”, combined with increased money offered as compensation. But the housing is often poor quality, and essential living costs such as electricity are significantly higher. This has led to accusations that the programme reproduces social inequalities, rather than addressing them. And for the 40 families that remain, the favela is home. One resident showed me around his house, where he had got married ten years ago, showing me photos with a smile on his face and joking with his wife. Their home was placed under eminent domain in March 2015. On top of this, Rio’s government has sent military police units to “pacify” the city’s favela communities. These communities have a reputation for being violent and dangerous, and authorities leverage those often misguided perceptions to justify using barbaric levels of force. A vast number of unlawful killings by police have been reported by human rights organisations. Alongside local residents, such organisations have played a significant role in documenting human rights violations in the lead up to the event. For example, the Popular Committee for the World Cup and Olympics in Rio de Janeiro recently released its fourth dossier of human rights abuses, covering the year 2015. Likewise, detailed daily coverage by news site RioOnWatch helps to hold the city to account and encourages residents. But there is another way. By celebrating the vibrant nature of favela communities, the city could make Vila Autódromo part of the show. The residents are incredibly friendly and welcoming, and have recently played host to events such as cultural festivals and football tournaments. By viewing favelas primarily as cultural assets, the city could incorporate Vila Autódromo into their plans for the Olympic Park, and use it to showcase the creativity and spirit of Rio, during those few days in August when the world comes to play. 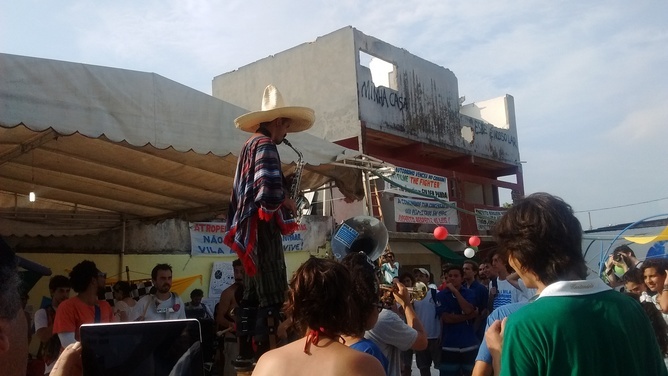 It’s not too late for the city to change: to provide upgrades for the residents in Vila Autódromo and use the community to show favelas to the world through a different, positive lens. "Ataque Brasil" plays to the crowd at a cultural festival. Image: Adam Talbot. In his excellent analysis of the likely legacy of Rio 2016, academic Jorge Knijnik concluded that the only hope is for civil society to counteract the injustices arising from Brazil’s turbulent sociopolitical environment. But more can be done. The activists I’ve met in Rio de Janeiro need support from citizens all over the world. Anyone who wants to see a fair Olympic Games – one which lives up to the promises of peace and respect made in the Olympic Charter – can add their voice to those already asking, “Olimpíadas para quem?” (“who are the Olympics for?”). By sharing the stories about human rights violations in the build up to the games and ensuring the voices of Rio’s residents are heard, people all over the world can help to achieve a greater social legacy for the Olympics. Adam Talbot is a doctoral researcher in the sociology of sport at the University of Brighton.